You are here: Home / Jewelry / Earrings / Harry Winston emeralds and diamonds. 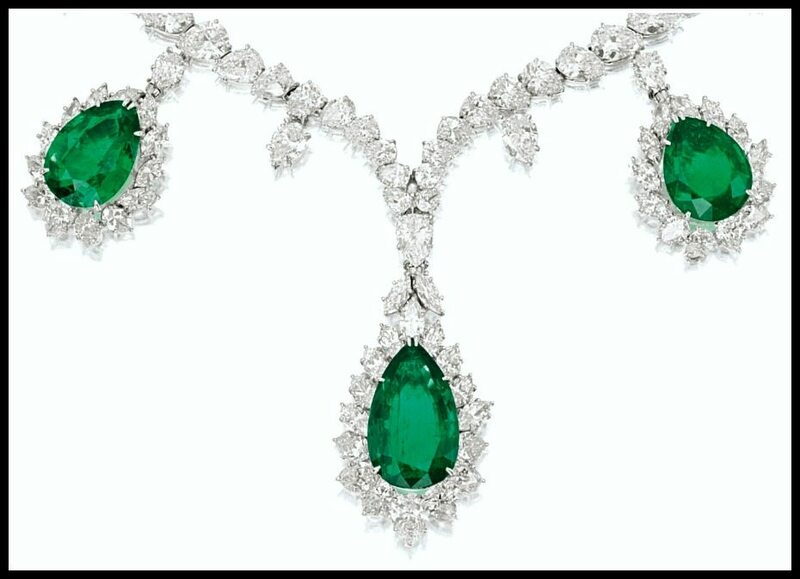 Harry Winston emeralds and diamonds. 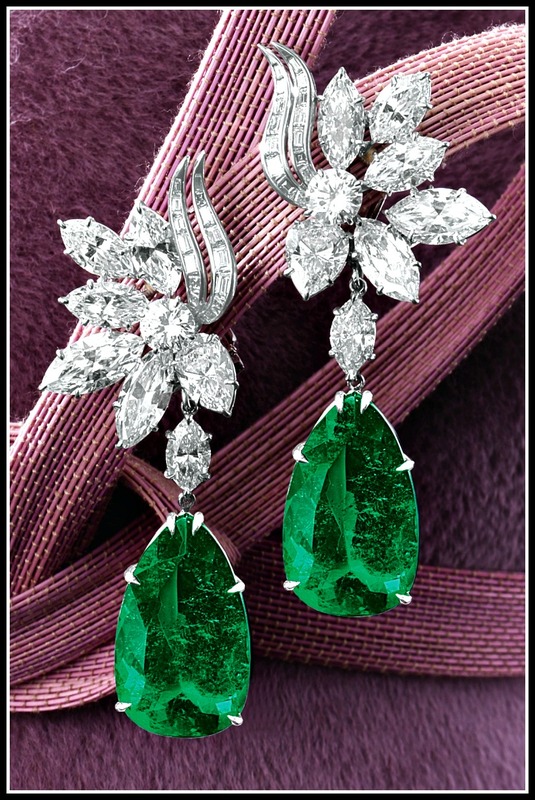 Today’s theme is Harry Winston emeralds and diamonds. Ready for something bold and glamorous? 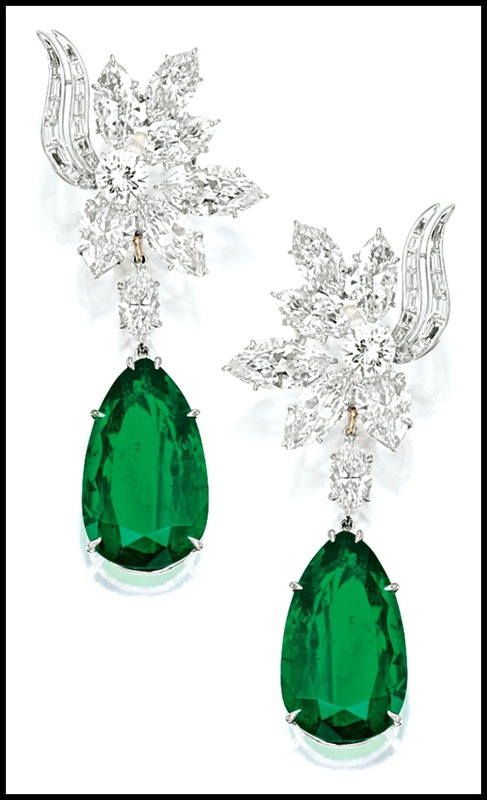 These Harry Winston earrings feature two emeralds, weighing 16.57 and 14.58 carats respectively, and two clustered surmounts with 14 total carats of marquise-, pear-shaped, brilliant-cut and baguette diamonds. Not too shabby. Here’s a clearer view, what I like to think of as a “sterile” shot. Nothing but earrings. Don’t you love the dynamic shape of the baguette diamonds reaching out of the surmount cluster? They’re almost like wings. I think they give the earrings a sassy feeling. In case you were wondering about that fuzzy pink background in the top photo, here the long shot. The fine folks at Sotheby’s felt that these earrings appeared to their best advantage when posted on a hat. (A fabulous hat, from the looks of things). 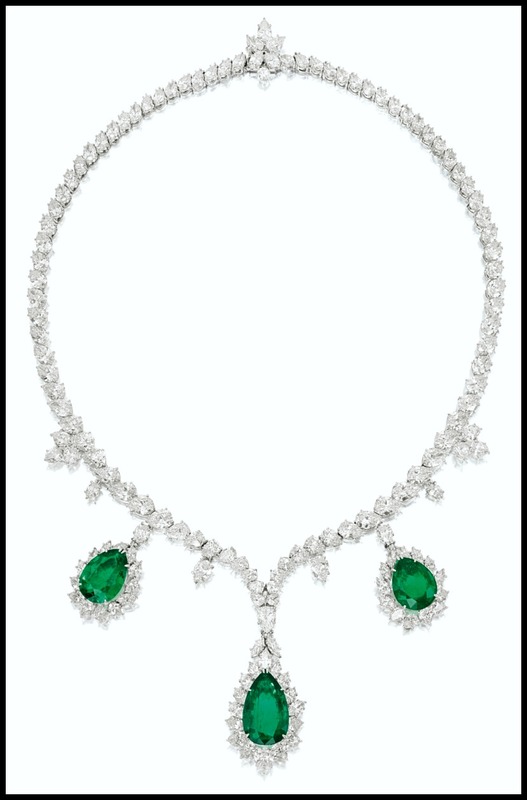 This necklace is for anyone out there who saw the earrings and though “not bad, but what would I wear with them?” As long as you’re okay with wearing a whole pile of Harry Winston emeralds and diamonds at once, that is. This platinum and white gold Harry Winston necklace features three glorious pear-shaped emeralds slightly smaller than the earrings’ emeralds, but still very impressive: they clock in at 10.61, 8.30 and 7.02 carats. The emeralds are wreathed in marquise- and pear-shaped diamonds and hang suspended from a necklace set with many more pear- and marquise-shaped diamonds. The total diamond weight of this piece is a whopping 32 carats. 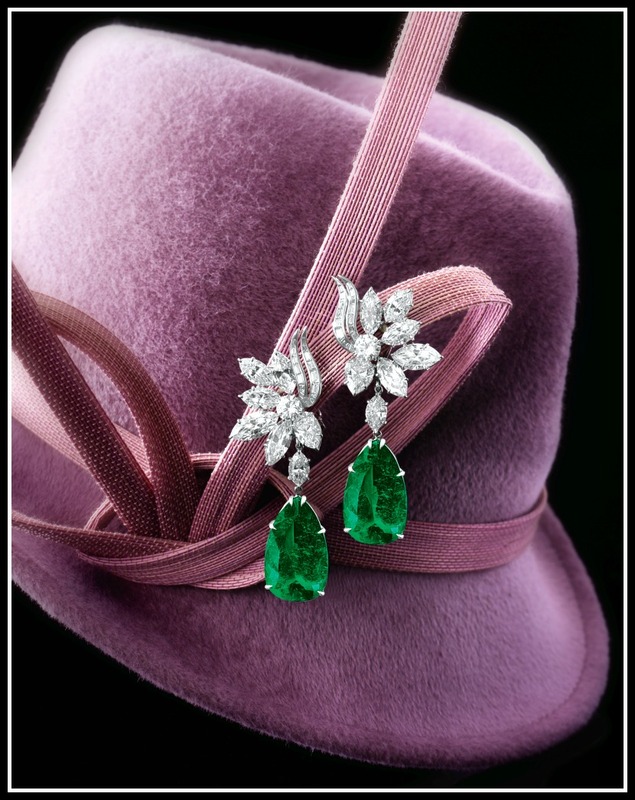 Today’s Harry Winston emeralds and diamonds were listed in the same Sotheby’s auction as separate lots. Click here for the earrings and here for the necklace. All images and info in this post are thanks to Sotheby’s. You had me at diamonds on a hat. And that, my dear, is why we are friends.